OnePlus 5T, the latest flagship from the emerging manufacturer, is now receiving a new OTA update. The device is now getting OxygenOS 4.7.6 which is a must-have update due to its impressive changelog. The update comes from the previous Oxygen OS 4.7.5 which brought several optimizations like a new camera app, optimizations to audio, face unlock, vibration motor, Wi-Fi battery usage, fingerprint, and GPS. Oxygen OS 4.7.6 for OnePlus 5T brings some more improvements to the camera app. It includes clarity for selfie pics in low lighting conditions. You will also see performance improvements to some third party camera apps. 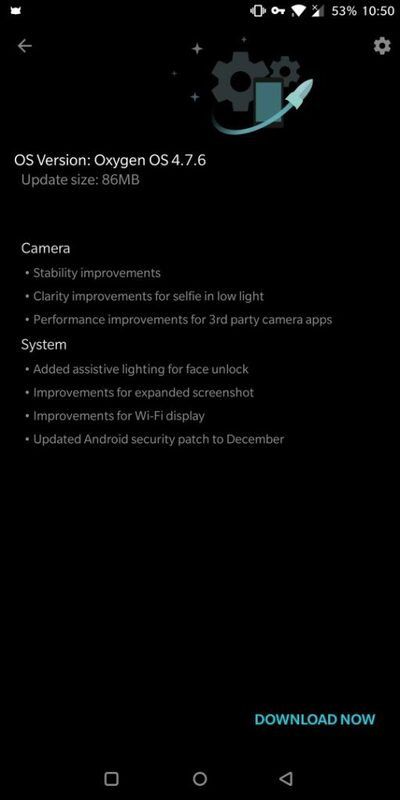 There are other camera app stability improvements which are not stated. The new OOS 4.7.6 update is not limited to just camera improvements. It features the latest December 2017 Android security patch. Other improvements can be seen for the expanded screenshots and Wi-Fi display. The greatest addition comes to the face unlock feature for OnePlus 5T. OnePlus added assistive lighting for face unlock. Which means it is now even easier to unlock the OnePlus 5T screen even in low lighting areas. Just to remind you that this update is still based on Android 7.1.1 Nougat. However, there are reports that the Open Beta program will soon start for the OnePlus 5T. On the contrary, the OnePlus 5, OnePlus 3/3T all have received Android 8.0 Oreo based Oxygen OS 5.0. We will soon see the update for the flagship. You can download the OTA update by changing the location to Canada or Germany via any VPN app. See how to capture OTA using VPN from the previous OxygenOS 4.7.5 post. You can also manually flash OxygenOS incremental OTA via adb sideload method: How to install OTA update via stock recovery? Alternatively, you can flash the full stock firmware via Local upgrade method safely using this tutorial: How to install using Local upgrade method?